kc bob: Does your Tipping reveal your Faith? My blog friend Alice is a waitress. I had this dialog with her in her blog's comments. Bob: One of the best sermons I have ever heard on money was one where the topic was generosity. The guy said that if you are not commited to being generous when you tip then you should not pray before you eat and give the rest of us a bad name. Sometimes I do think that people are just cheap though. A few weeks ago a friend told me that he is not generous when he tips if the service is bad. LOL, I told him that he apparently does not believe in grace or mercy. 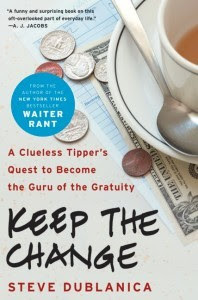 Sometimes waitstaff most need generosity when they are not at their best. Bob: Would that preachers talked more about being generous to waitstaff than being generous to the institutions that employ them. People of faith need to hear it. So I share this in hopes that you will be more generous when you next dine out. Even if your server is having a bad day. It doesn't even need to be over-the-top on tipping, just the standard 15-18% would be great. So true Alice. Folks have such a narrow view of generosity. We always tip 20% except for when we get really horrible service, then it will be 15%.